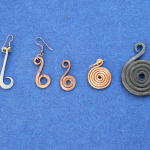 Originally my interest in jewellery came from a research project I conducted to determine what tools were needed to make simple copper jewellery. The elegance of these simple designs fired my imagination and also a desire to make copies of other jewellery from antiquity. Lewes Loop. 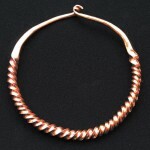 Bronze copy of an Iron Age bracelet found near Lewes, Sussex. 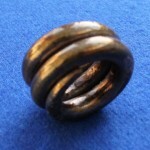 Bronze copy of an Iron Age torque found near Lewes, Sussex. 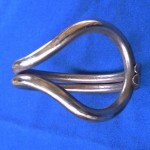 Bronze copy of an Iron Age Hair Ring. Much jewellery is very ornate and though of superb craftsmanship it does not inspire me as much as the simple elegant designs do. 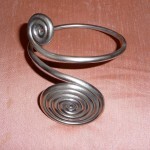 Copies of ancient jewellery inspired from the natural form of the spiral. 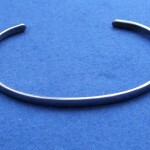 Neck Band made of Stainless Steel. The pendants, earrings and bracelets that I make have proved to be very popular and been purchased by people from all over the world.